Today is my first morning with badge access to my office on Wall Street so I actually get to go in nice and early since I don’t have to rely on having someone there that I can reach to come down and let me into the office. So I was able to get back onto my five in the morning cycle and to get out the door while Dominica is just starting to get ready for work. Before going into the office this morning I finished reading Paul Graham’s “Hackers and Painters” which I highly recommend to anyone working in IT, thinking of working in IT or really to just about anyone as so much of it has very little to do with IT at all except for the last few chapters that deal heavily with programming languages and those bits are easy to skip if you are not interested. “Hackers and Painters” is certainly one of the most important works in the field for this decade. I timed my trip into the office today. It takes about fifteen minutes for me to get from the apartment to the train. And then it takes about fifteen minutes for the train to go from Newark to the World Trade Center in Manhattan. The distance, according to Google Maps, is .4 miles from the apartment to the train. Then, once I am in Manhattan, it is .7 miles from the World Trade Center PATH Station to the far end of Wall Street where I work. Google Maps won’t quite show the path that I take but this is approximate. 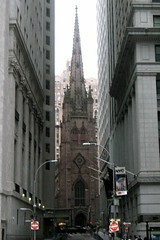 I actually go down Church to Cedar and then cross diagonally down Broadway / Canyon of Heroes to the head of Wall Street at Trinity Church and then walk down the length of Wall Street to the very end at the South Street Seaport and the Wall Street Piers. This morning is cool and drizzly. Perfect for walking. And I am happier now that I know that I am walking about 2.2 miles per day. That is more than I thought that I was doing. No wonder I am feeling it. I walk pretty briskly that entire way. For lunch I went out for Malaysian with one of the guys that I work with. We walked (yes, walked again) up to Chinatown which, according to Google Maps, was about a mile and a half in each direction for an additional three miles today. Over five total miles. Not too shabby. The food at the New Malaysia was very good. I am loving working in Manhattan. The afternoon whizzed by after taking a late lunch. On my way home I stopped by the Borders on Broad and Wall by Trinity Church and checked out their technology books section – quite impressive. The section itself is small but very well stocked. I am really going to enjoy walking by here every day (although not as much as Border’s is going to enjoy it!) I already found tons of books that I want to read. I decided to pick something up to read on the subway: DeMarco and Lister’s “Peopleware” which is one of the quintessential software project management books along with “The Mythical Man Month” which I have read before. I managed to read several chapters on the train. I got to Eleven80 just in time to meet the guys who were going to head up to Min and my apartment to mount our LCD television on to our bedroom wall. So I took them up and we spent an hour or so working on that. It took some doing but now we have our thirty-two inch Westinghouse 720p LCD hanging above our bedroom closets so that it can be easily watched from our bed. It is very cool. Our goal is to have a computer with a built in DVD player in there and the AppleTV. But we will need an HDMI switcher if we are going to do that. For the moment we just have the DVD player from the living room moved in there until we can get the rest of the stuff sorted out. I will probably move the PS2 in there tomorrow. The PS2 is going to be our bedroom system and the Wii is going to be our living room system. And, eventually, we expect an XBOX 360 as well but we can’t totally decide on that quite yet. Because so many of the new devices get so hot and can’t be stored in a cabinet we are hesitant to get them and have to have them sitting on the floor. Dominica did some light grocery shopping today and spent her evening cooking Oreo’s food for the week. We had some frozen Kashi pizzas for dinner and called it an early night. I had to do some late evening work for the office but that didn’t take too long. For some reason I am feeling really exhausted (probably a lack of caffeine after getting used to having so much – I didn’t even have a coffee all day) and need to get to bed early. We wrapped up the first season of The Cosby Show and started the second season. Watching television from bed rocks. I haven’t had anything like this in my bedroom for a very long time. When I lived at my parents’ house post-highschool I had a thirteen inch Commodore Amiga computer monitor hooked to my Sony (and later Pioneer) laserdisc player that I could watch from bed but the image was so small that it wasn’t really practicable. Then again when I lived in Greenleaf Meadows in Greece with Josh and Andy for a short time we had two televisions and I was able to have my thirty-two inch Sony Trinitron CRT on top of my dresser in my bedroom but the only device that I ever hooked to it was the original Playstation. It was there that I used to spend hours playing through Suikoden. Not since Greenlead Meadows in 1999 have I had any sort of television in my bedroom.